December 18, 2015 By This post may contain affiliate links. 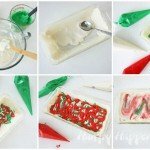 Cut into these festive Christmas Tie-Dye Cakes to reveal swirls of red, white, and green color. 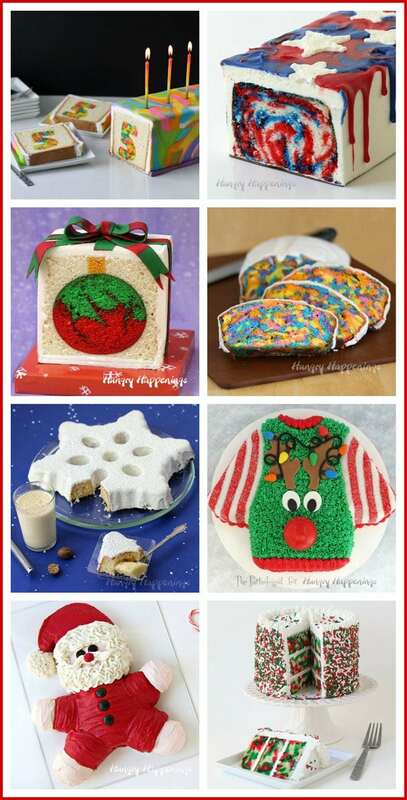 These holiday desserts are as fun to make as they are to eat. This holiday season, have some fun making festive looking tie-dye pound cakes or layer cakes. 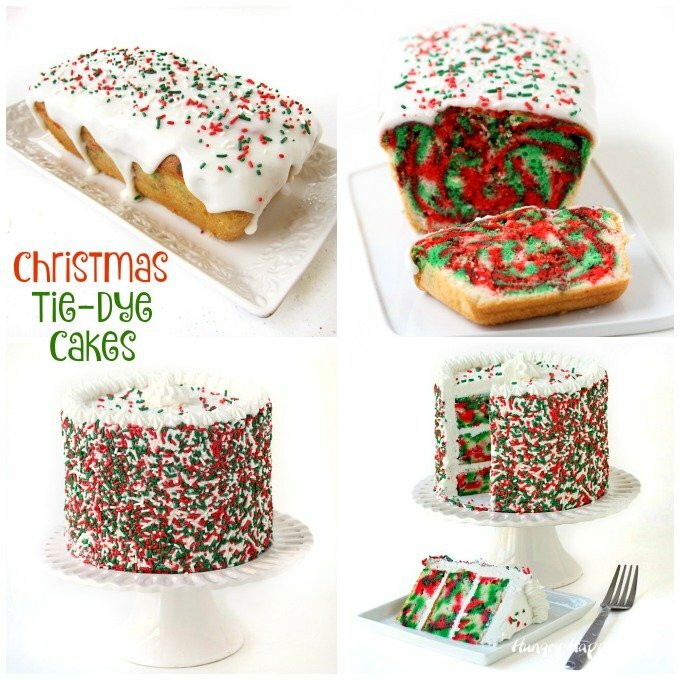 Each cake has swirls of red, white and green throughout and sprinkles on the outside. At the holidays, it’s been a tradition for my family to bake loaves of pumpkin bread to give to friends as gifts. 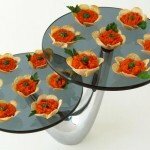 This holiday I thought I’d flip that tradition upside down and inside out by making some of these funky cakes instead. I love the thought of my friends cutting their first slice of their pound cake and being surprised to see the brightly colored interior. The outside of the cake, looks pretty normal. You can see small flecks of red and green color on the sides of the cake and the red, white, and green jimmies sprinkled over the glazed top might give you a clue, but I really don’t think most people would expect to find a tie-dye interior. Well, actually, now that I think about it, maybe my friends would. They are getting pretty used to getting crazy desserts from me. But, I don’t think your friends will. To make your tie-dye pound cakes you’ll want a nice white cake base to begin with. Being most pound cakes are actually yellow, I opted to doctor a white cake mix and made mine coconut flavored. This coconut pound cake recipe is one of my absolute favorite cake recipes. 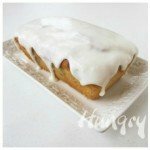 I used last year to make a Red, White and Blue Tie-Dye Pound Cake which was covered with the most amazing coconut frosting made with coconut candy melts. 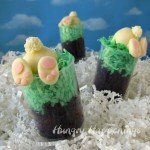 Sadly those candy melts were a seasonal product and are no longer available, so I just topped this cakes with a simple coconut glaze. I loved it too. If you aren’t a fan of coconut, you can swap out the coconut milk for any kind of milk you prefer and just leave the coconut out of the cake recipe. For the glaze just use your favorite milk and vanilla extract. 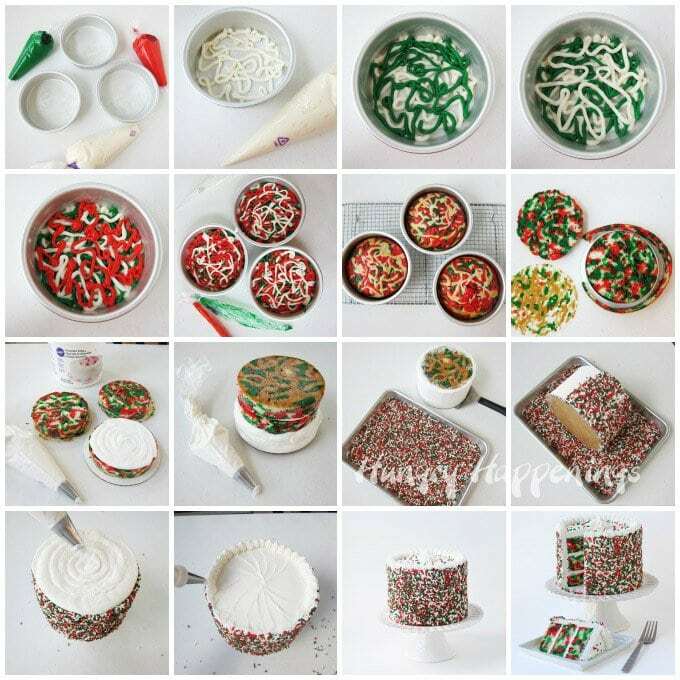 A delicately flavored coconut cake swirled with red and green colors topped with a glaze and Christmas sprinkles. Spray at 9 inch by 5 inch loaf pan with non-stick baking spray. Combine cake mix with egg whites, water and coconut milk. Beat on low for 30 seconds, then beat on high for 2 minutes. Finely chop the coconut, using a mini food processor or knife. Fold coconut into cake batter. Divide one half of the batter into equal parts and pour into two bowls. Color one red and one green. Pour red batter into a pastry bag and green into another bag. Spoon 1/2 cup of the white batter into the loaf pan and brush it around the bottom and up the sides of the pan. Pour the remaining white batter into a large pastry bag. Pipe a small amount of green batter in a squiggly pattern into pan. Pipe on some white squiggles then some red. 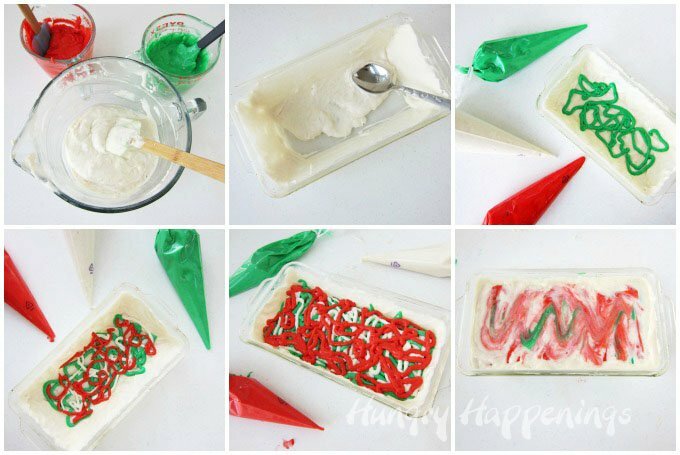 Repeat creating layers of green, white, red, then white squiggles until all the red and green batter is gone. Pipe on the remaining white batter and smooth out the top. 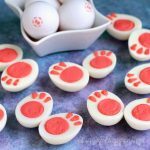 Tap the loaf pan on the counter a few times to remove big air bubbles. Bake the pound cake for 50-60 minutes until a toothpick inserted in the center comes out clean. Allow the cake to cool for 10 minutes in the pan, then turn it out onto a cooling rack and allow it to cool completely. Stir the powdered sugar, 2 tablespoons coconut milk, and coconut extract together. Stir in more coconut milk, if needed, until you have a nice thick, yet pourable glaze. If you want to make a fancier tie-dye Christmas cake you could bake the cake in 6 inch round cake pans then layer and frost them. I made this 3 layer red, white, and green swirl cake for a game night we had recently. Making a layered cake is more work, but a cake like this would make a very impressive Christmas dessert. 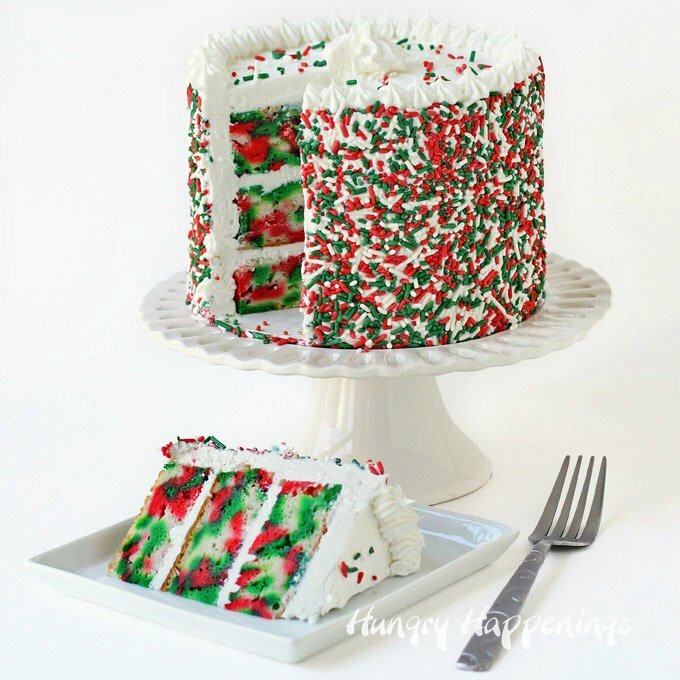 To make this cake, layer in squiggles of red, white, and green cake batter into three 6 inch round pans. Bake for about 25 minutes, then cool. Trim and layer with frosting. Frost the outside, leaving the top plain. Then roll in sprinkles. Frost the top. 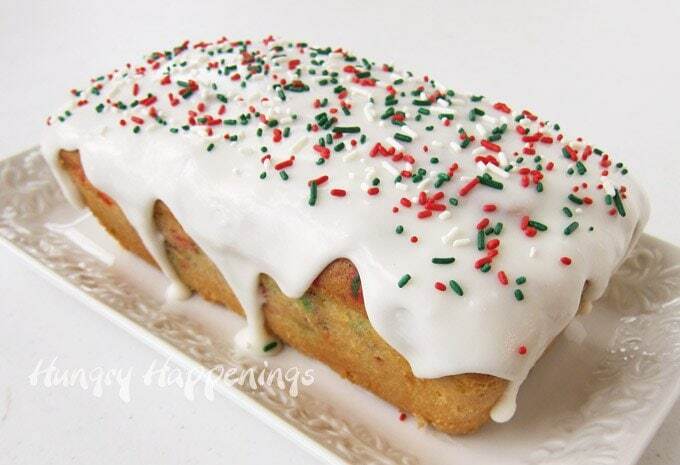 Add some sprinkles and you are ready to serve. It doesn’t sound too hard, does it? It actually wasn’t a very challenging cake to make, but sure did impress my friends, especially those who love sprinkles. 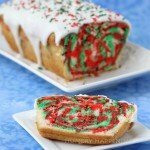 If you like this Christmas Tie-Dye Pound Cake, you might also like these fun special occasion cakes. You have some lucky friends for sure! I made a tye dye cake for my grandson’s birthday several years ago and he just loved it. Don’t know why I haven’t made another one. 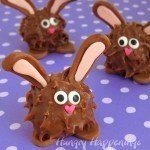 I like your method much better than mine and I think the kids would have a blast making these! Believe it or not, I’m still using my coconut candy melts and I still have a couple bags left! 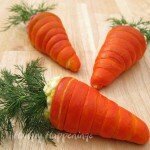 I’m hoping they bring them back next year. 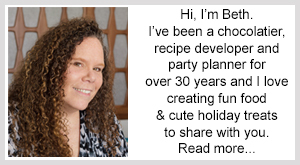 I’ll have to try your coconut glaze as it just sounds delicious! Merry Chritmas to you and your family! I know, I don’t know why it’s been so long since I made a tie-dye cake either. It was fun making these for Christmas. I am on my very last bag of Coconut Candy Melts and I really want more. 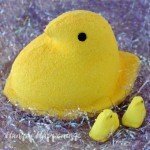 They are my favorite of all the flavored Candy Melts. They really made the most delicious frosting. I hope you have a wonderful Christmas too.